Our wooden outdoor playhouses are professionally constructed. Finely crafted of quality materials and built to safety and durability standards you might expect to see in an adult-sized house. 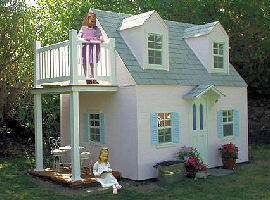 This is the kind of playhouse you might build for your own child if you had the time and the patience to do it. They're just the right size to make your little ones feel at home, but with plenty of room for growth -- physically, mentally and emotionally. There's even enough room in there for you. If your child invites you in, of course.